Protected: Login to Get Special Content! Ready for more Kai and Jane? 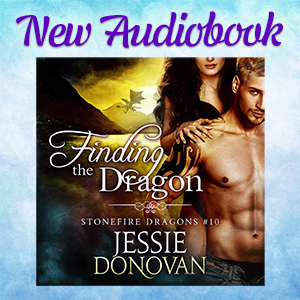 Finding the Dragon is available in audio! (Which now means Stonefire is all caught up. 🙂 ) This time, Kai and Jane go to Wales to locate his missing sister. If that wasn’t enough to worry about, someone from Kai’s past tries to tear them apart. Prefer the ebook or paperback versions? You can find all the links on my website. PS—Did you miss the first book in the series, Sacrificed to the Dragon? You can find all of the links on my website here. PPS—Want to try Audible free for thirty days and get two free audiobooks? Learn more here. Chelsea: I want to meet Alice!!!! I am on pins and needles waiting for her book!!! Want to hear the latest updates, be the first to see new covers, read exclusive excerpts, and receive new release alerts? Then sign-up for Jessie Donovan's newsletter! © 2019 Jessie Donovan. All rights reserved.